Talking about what you want to happen to your property after you die, isn't exactly the preferred topic of conversation among most people. But if you wish to spare your loved ones from potentially serious legal headaches after your passing, it needs to be done, and now, not later. The consequences of not preparing directives as to how you wish your property and estate to be distributed after your death, can be financially costly, and emotionally painful. 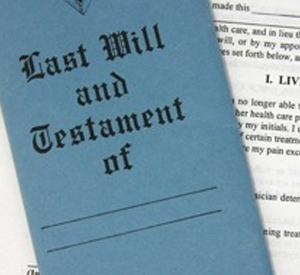 Persons who die without a will in Massachusetts are known legally as "intestate." What that means, is that whatever property you own at the time of your death, will pass according to a law in Massachusetts which governs the distribution of property for people who die without a valid will. This law is known as the "intestacy statute," as people who die without a valid will are referred to as "intestate." This means that you will have absolutely no say in how your property and estate is divided, nor to whom it passes. Further, it is possible that if your estate is large enough (over $1 million in gross taxable value) your estate will owe the Commonwealth substantial estate taxes on your estate - money which could have been given to the recipients of your choice. The current federal estate tax exemption for 2008 is $2 million. You should note: It is not that hard for many persons to leave a taxable estate with a gross value over $1 million in Massachusetts. A primary residence alone can exceed $500,000.00 in valuation, not counting life insurance, jewelry, stocks and bonds, savings and money market accounts, and other items of personal property. This is not uncommon. Aside from purely estate planning, there are two other documents that typically accompany execution of a will or trust, and these instruments are equally important for you and your family's welfare. These instruments are called a Durable Power of Attorney and a Health Care Proxy. Briefly, a Durable Power of Attorney is an instrument that, in the event of your mental incapacity due to illness or accident, conveys authority in another person that you would name, to manage your financial and legal affairs on your behalf. A determination that you no longer possess capacity to act on your own behalf, is attested to by at least one physician. For security reasons, any person you so empower, cannot simply decide "on their own" that you "lack capacity." This person (which could be either an individual person or a financial institution such as a bank) would have authority to conduct all financial, contractual and legal affairs on your behalf that you would normally have: The person can open and close bank accounts, make deposits, withdrawals and payments, enter into contracts and agreements, and buy or sell real estate. The person so acting in this capacity, acts as a "fiduciary," meaning they must only act for your benefit, and in your best interests. Legal procedures and safeguards exist to remove any such person who does not act in good faith to protect your interests. A Health Care Proxy is an instrument many people have already heard of. This document transfers authority to another named person (an "Agent") to make medical and health care decisions for you, in the event, due to illness or accident, that you are mentally incapacitated to make such decisions for yourself. This instrument covers a wide array of situations and circumstances requiring medical and health care decision-making. A Health Care Proxy also spells out the medical circumstances under which you would no longer wish to receive life-support treatment or heroic medical measures. As with a Durable Power of Attorney, the Agent you name cannot unilaterally exercise such decision-making authority, but can only do so when and if your Attending Physician makes a written determination that you lack capacity to make health care decisions for yourself, or to communicate your decisions. The Agent's authority will end immediately if your Attending Physician determines that you have regained capacity to make your own health care decisions. As an added security measure, there are provisions to assure that even if your Attending Physician makes a determination that you lack capacity to make your own health care decisions, if you object to any decision made by your Agent, your decision will prevail unless a court of competent jurisdiction determines that you lack capacity. Going through the process of making decisions about who will receive your property and assets at your death, and of who would be authorized to make financial, legal and medical decisions on your behalf if your were incapacitated, is not exactly the most inviting thing to do on most people's "To Do" list. But it's important, and we can make it easy (even interesting). Don't make the mistake of not preparing a will and estate plan. From simple wills to complex trusts, there are a variety of legal vehicles and instruments to assure that your estate is distributed as you want it to be, and with a minimum of estate tax impacts. Contact us for a free consultation and we can advise you. "When I fell in that supermarket and knew I had broken my leg, one of the first things that went through my mind was, "How am I ever going to take on a company this size and receive any decent compensation for what's happened to me?" Because of you, I received a sizable settlement payment for my injury. I hope more people learn about the kind of legal talent you offer." Jeanine W.
"The act of placing my father in a nursing home was probably the most painful decision I've ever had to face. You took our case on, and you and your associates fought the owners of this business, tooth and nail. You never gave up. As a result, my father's estate was paid considerable money for his pain and suffering." Joan W.
"My whole life changed on a dark day in December 1989, when I was hit and pinned against a wall by a commercial delivery truck. I was almost DOA at the hospital Emergency Room. Because of my injuries, I cannot work full-time ever again. Because of you and your colleagues' work, I received a large settlement." Jim Y. "My mother had suffered a heart attack in the fall, and the hospital doctors completely missed this in her vital signs and EKG. My mother died the next day, and she didn't have to. But because of your diligence and talent, her estate received a very large settlement payment, along with revised ER protocols to prevent such errors in the future. For my mother and future patients, we thank you for what you did for her." Dorothy W.
"When our son was hit by a car in a crosswalk, our one and only concern was his recovery and well-being. We had no idea what we were facing: A maze of obstacles put up in our path by the insurance company for the driver who hit our son - denying responsibility for the accident. If we hadn't had you by our side, we feel we would have been eaten alive by this insurance company's lawyers. You guided us from day one, and you never rested." Bob and Mary J. "You know what impressed me most about you (aside from your legal talent)? I know that my injuries from my car accident weren't the worst that you had in front of you - my case was far from the biggest case in your office - but you represented me like my case was worth a million dollars. I can't thank you enough." Margaret G.
"There are two things that I will never forget about my car accident: The sound of screeching tires just before my car was hit by the other driver, and, much later, the sound of you telling me that the entire ordeal was over with, and that I was going to receive just compensation for my injuries. The rest, I want to forget - but I'll never forget you and what you did for me." Karen D.
We serve the following localities: Essex County including Danvers and Beverly; Norfolk County including Braintree, Brookline, Foxborough, Norwood, Quincy, Westwood, and Wrentham; Suffolk County including Boston and West Roxbury; Barnstable County including Falmouth, Hyannis, and Sandwich; Bristol County including Attleboro, New Bedford, and Fall River; Middlesex County including Burlington, Framingham, and Waltham; and Plymouth County including Marshfield, Middleborough, and Plymouth.